Japanese Episode AG 154: "The Battle Dome! A Fusion of Fire and Water!!" American Episode 424: "Tactics Theatrics!!" Satoshi has arrived at the Battle Dome! After being interviewed by the Frontier Brain's many fans, Satoshi jumps right into the battle with the Dome Superstar Heath! Heath reveals his picks for the battle - Windie and Laglarge - and invites Satoshi to base his team on this information. Satoshi responds by picking Heigani and Ohsubame. The battle begins, and at first Satoshi is overwhelmed by Heath's strategy of using his pokemon's speed and defensive techniques. 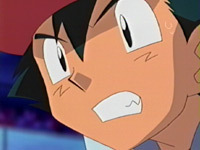 As Satoshi launches attack after attack, Heath is able to counter every onslaught by combining his pokemon's skills to form an unbeatable defense. As Satoshi wonders how to beat such a clever tactician, he realizes that Heath's fusion of water and fire can be used against him by creating a fog that hinders his opponents' vision. Satoshi uses the fog to enable him to bluff an attack and catch Windie and Laglarge off guard, enabling his pokemon to land a devastating final blow. Both of Heath's pokemon are knocked out, earning Satoshi a victory! As Satoshi picks up his third Frontier Symbol, he eagerly anticipates his next Frontier Brain battle. In true Season One fashion, we get a Gym Leader Frontier Brain battle mere weeks after the last one. And, in true Season One fashion, the introduction of Satoshi's opponent is short, rushed, and leaving us wanting more. That's the way I feel about Heath. While the anime producers did an admirable job of fitting a crapload of events into one episode, I do wonder how much better the battle could have turned out if it was a two-parter. At least then, it would have made Satoshi's victory have more weight to it than it does in this one. I mean, he decides to use fog (a technique he's used plenty of times before) to get one hit on his opponents and just happens to knock them both out at the same time? Can you say "cop-out?" The English version really impressed me. Everyone does a top-notch performance in this episode, and it's much more enjoyable as a result. Sarah Natochenny, in particular, does a great job of bringing her character to life, and anyone who maintains that the actress hasn't improved at all only needs to compare her performance here to the one in "Wheel of Frontier." In particular, the way she screams out for Swellow after it gets hit by one of Tucker's attacks is WORLDS better than her "No, Snorlax" line in the Greta battle. The only voice gripe I have is Tucker. Now don't get me wrong...it's a great voice, but I kept getting distracted by the echo they gave the character while he's in the stadium. At first, I thought that PUSA was going for a "Tucker has a microphone" effect (it is a performance, after all), but the thing is is that they didn't do the same thing for Ash. Does this mean Tucker gave himself a mic but neglected to give one to Ash? Or was PUSA just too lazy to apply the effect to both voices? My only other complaint about the dub is the music. The English version keeps five pieces of Japanese music, which is really quite low for what's essentially a Gym battle. While 4Kids' battle music can get the job done in the regular episodes, it is simply not "grand" enough to carry a Gym battle the way the Japanese music does. In the Japanese version of the opening theme, the big group shot of the Frontier Brains is changed so that Heath is unshadowed. For you dub fans, that would be the big group shot used in the Advanced Battle opening, not the one in the Battle Frontier opening. Windie keeps its Japanese voice. Episodes like this one really make me wish NoA had come up with a name other than "Aerial Ace." The Japanese name of the attack, Tsubame Gaeshi, comes from an attack made famous by the samurai Sasaki Kojirou. If that name sounds familiar to you, it'll be because he was the guy after whom the Rocket-Dan member was named. So anyway, you can read up on the attack over at the link provided, but the long and the short of it is that the technique in Pocket Monsters is supposed to be reminiscent of Sasaki's super rapid sword attack. The name given to the attack in the English versions of the games is Aerial Ace, which suggests that it's something that can only be done mid-flight. A quick look at a list of all the pokemon who can perform the attack confirms that this is not the case. The English name has worked pretty well for the TV series because it is a flying-type attack (most likely due to the word for "swallow," tsubame, being right there in the attack name) and has so far only been performed by flying-type pokemon. But now that Windie is shown performing the attack, the name given to it by Nintendo of America no longer makes sense. It's kind of like how "Mr. Mime" was an OK name in Generation I, but suddenly stopped making sense once female members of the species started popping up in Generation II. 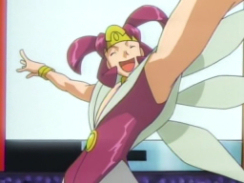 "Mr." Mime doesn't make sense today, and neither does a lion / dog thing using an attack called "Aerial Ace." There's nothing we can do about it now, of course, but I still wanted to point out this little thing that got lost in translation. Battle Frontier is played in the Japanese version when Satoshi's pokemon start to get the upper hand against Heath's pokemon. In the dub, generic 4Kids dub music is used. Three seconds are added to the TO BE CONTINUED... screen. Quel surprise!